Australopithecus (from Latin australis, meaning "of the south," and Greek pithekos, meaning "ape") is a group of extinct hominids that are closely related to modern humans. They were widespread in eastern and southern Africa from about 4 million years ago (mya) to 2 mya, appearing during the Pliocene epoch. Australopithecus is sometimes referred to as the gracile (slender) australopithecines. They appeared earlier in the fossil record than Paranthropus, which are often called the robust australopithecines. However, some consider the robust species aethiopicus, boisei, and robustus as included within the genus Australopithecus, rather than recognize the separate genus of Paranthropus. When the term australopithecine is used alone, it refers to species of both genera. According to Mayr (2001), the fossil record reveals that Australopithecus remained essentially unchanged throughout their long history. Australopithecus is considered to have provided the foundation for modern humans. Even many theologians and others who believe that human beings are special creations of God allow for Australopithecus and its precursors to have fulfilled roles either in creating the human physical aspect or in preparing the environment for modern humans. Australopithecus species were bipedal, although it is speculated that they lived mostly arboreally, that is, mainly in trees; the length of their arms was larger than modern humans (Mayr 2001). The brains of most species of Australopithecus were roughly 35 percent of the size of that of a modern human brain. Mayr (2001) reports that both A. afarensis and A. africanus had brains of about 430–485 cc. Most species of Australopithecus were diminutive and gracile, usually standing no more than 1.2 to 1.4 m (approx. 4 to 4.5 feet) tall. In several variations of Australopithecine there is a considerable degree of sexual dimorphism, meaning that males are larger than females. Modern hominids do not appear to display sexual dimorphism to the same degree—particularly, modern humans display a low degree of sexual dimorphism, with males being 15 percent larger than females, on average. In Australopithecines, males can be up to 50 percent larger than females. New research suggests that sexual dimorphism may be far less pronounced than this, but there is still much debate on the subject. Mayr (2001) considers the australopithecines (both genera) to likely have been vegetarians. Australopithecus is a hominid, a term whose meaning has changed over time. Originally, the term was restricted to humans and their extinct relatives. Such a meaning is still assumed by many anthropologists and lay people. Technically, today, however, the term hominid refers to any member of the biological family Hominidae (the "great apes"), a group of primates that includes chimpanzees, gorillas, orangutans, and as well extinct and extant humans. The term hominan is used in specific reference to any member of the sub-tribe Hominina: humans and their close extinct relatives. Australopithecus afarensis and Australopithecus africanus are among the most famous of the extinct hominids. Although opinions differ as to whether the species aethiopicus, boisei, and robustus should be included within the genus Australopithecus, the current consensus in the scientific community is that they should be placed in the distinct genus of Paranthropus, which is believed to have developed from the ancestral Australopithecus line. The species aethiopicus may not be distinguishable from boisei (Mayr 2001). A. africanus lived in the same region of southern Africa as a member of the robust lineage, P. robustus (or A. robustus); in eastern Africa, the robust species P. boisei lived from about 3.5 to 3.0 mya with the gracile species A. afarensis and with Homo from about 2.4 to 1.9 mya (Mayr 2001). The earliest primate fossils date to the late Cretaceous period (Mayr 2001), over 65 million years ago (mya). About 33 to 24 mya, apes appeared, and the fossil monkey Aegyptopithecus, dated to about 33 mya, of the late Oligocene, exhibited some apelike characteristics (Mayr 2001). Proconsul, about 23 to 15 mya, is considered to have clearly been an ape (Mayr 2001). No hominid fossils have been found for the time period from about 13 to 6 mya (Mayr 2001). In 1924, the first fossil hominid, Australopithecus africanus, was discovered in Africa. This species of gracile Australopithecus is considered to have lived from about 3.0 to 2.4 mya. Another well-known species, Australopithecus afarensis, is older. Since that first find, quite a number of hominid fossils of these and other species have been found, but for the most part, the early hominid fossil record is very incomplete (Mayr 2001). The gracile australopithecines in general lived from about 3.8 mya to 2.4 mya. Mayr (2001) states: "What is most noteworthy, however, is that they did not change very much in this whole 1.5-million-year-long period." Gracile australopithecines shared several traits with modern apes and humans and were widespread throughout eastern and southern Africa as early as 3.8 to as late as 1.2 million years ago. The fossil record seems to indicate that Australopithecus (the gracile australopithecines) is the common ancestor of the Paranthropus group (the "robust australopithecines"). However, Mayr (2001) reports that the robust species, P. aethiopicus (perhaps the same as P. boisei), existed around 3.8 mya. The earliest evidence of fundamentally bipedal hominids can be observed at the site of Laetoli in Tanzania. These hominid footprints are remarkably similar to modern human footprints and have been dated as far as 3.7 million years old. However, no known scientific method can identify anything that far back with such accuracy and so views on the age of Australopithecus date it from anywhere between 3.7–2.2 million years. Until recently, the footprints have generally been classified as Australopithecine because that had been the only form of pre-human known to have existed in that region at that time; however, some scholars have considered reassigning them to a yet unidentified very early species of the genus Homo. Although the intelligence of these early hominines was likely no more sophisticated than modern apes, the bipedal stature is the key evidence that distinguishes the group from previous quadrupedal primates. The morphology of Australopithecus upsets what scientists previously believed, namely, that large brains preceded bipedalism. If A. afarensis was the definite hominine that left the footprints at Laetoli, it strengthens the notion that A. afarensis had a small brain but was a biped. Fossil evidence such as this has made it clear that bipedalism far predated large brains. However, it remains a matter of controversy how bipedalism first arose millions of years ago (several concepts are still being studied). The advantages of bipedalism allowed hands to be free for grasping objects (e.g. carrying food and young), and allowed the eyes to look over tall grasses for possible food sources or predators. However, many anthropologists argue that these advantages were not large enough to cause bipedalism through natural selection. Radical changes in morphology took place in the appearance of gracial Australopithecines; the pelvis structure and feet are almost indistinguishable in comparison to modern humans. The teeth are aligned just as modern humans with small canines; however, Paranthropus had a larger, thicker dentition. Australopithecines faced one particular challenge while living on the savanna. They likely were the slowest-moving primates at the time and many likely fell prey to carnivorous creatures (lions and the extinct Dinofelis). The fossil record suggests that Australopithecus could be the common ancestor of the genus Homo, which includes modern humans. One view of theologians who believe that human beings are a special creation of God is that the process of creation worked by stages, with previous stages and life forms serving as the foundation for later stages and life forms. The creation of organisms that could photosynthesize, for example, was necessary to create an oxygen environment for later-stage animals. Such a step-by-step process can also be seen in the precursors to humans, such as early "ape-man," Australopithecus. These stages were required in the course of developing the physical body to house the human spirit. The process of development is what is seen on the external level through the appearance of fossils. Although a lot of conclusions and speculations are drawn from fossil findings, it is important to remember that the actual fossil record for hominids is very incomplete. Accounts of how bipedalism developed or how the brain evolved may be based on fossils finds of only parts of the skull, parts of a mandible, or parts of a leg or arm. According to Mayr (2001), fossils of hominids from about 13 mya to 7 or 6 mya are unknown. It is important to keep this reality in mind when drawing conclusions regarding the origin of humans. A. africanus used to be regarded as ancestral to the genus Homo (in particular Homo erectus). However, fossils assigned to the genus Homo have been found that are older than A. africanus. 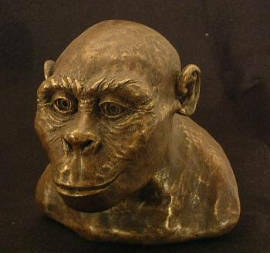 Thus, it is speculated that the genus Homo either split off from the genus Australopithecus at an earlier date (the latest common ancestor being A. afarensis or an even earlier form, possibly Kenyanthropus platyops), or both developed from a yet, possibly unknown, common ancestor independently. According to the Chimpanzee Genome Project, both human (Ardipithecus, Australopithecus, and Homo) and chimpanzee (Pan troglodytes and Pan paniscus) lineages diverged from a common ancestor about 5–6 million years ago, if one assumes a constant rate of evolution. However, more recently discovered hominids are somewhat older than the molecular clock would theorize. Sahelanthropus tchadensis, commonly called "Toumai," is about 7 million years old and Orrorin tugenensis lived at least 6 million years ago. The location of the mastoid of both indicates that they were bipedal and had therefore diverged from the common ancestor much further back along the evolutionary trail. Since little is known of them, they remain controversial among scientists since the molecular clock in humans has determined that humans and chimpanzees had an evolutionary split at least a million years later. As molecular evidence has accumulated, the constant-rate assumption has proven unreliable—or at least overly general. However, while the molecular clock cannot necessarily be assumed to be true, it does hold in many cases, and these can be tested for. For example, molecular clock users are developing workaround solutions using a number of statistical approaches including maximum likelihood techniques and later Bayesian modeling. Most species of Australopithecus are considered to not have been any more adept at tool use than modern non-human primates. Yet modern African apes, chimpanzees, and most recently gorillas, have been known to use simple tools (i.e. cracking open nuts with stones and using long sticks to dig for termites in mounds). However, Australopithecus garhi does appear to have been the most advanced of the line with its presumably older stone tool artifacts than the earliest genus Homo member known so far—Homo habilis. A. garhi's remains have been found with tools and butchered animal remains, suggesting the incipience of a very primitive tool industry. This led many scientists to suspect that A. garhi may be the ancestor of the Homo genus. However, further evidence may help scientists to determine the true ancestor species. White, T. D. et al. 2006. Asa Issie, Aramis, and the Origin of Australopithecus. Nature 440:883–89. Retrieved June 20, 2007. This page was last modified on 29 August 2008, at 13:14.